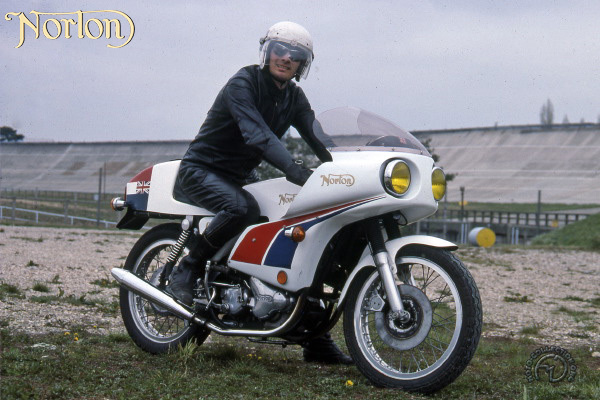 Rider/tuner Peter Williams joined Norton in 1969 and began developing a 750cc production racer using a power unit developed from the Commando twin. It first appeared in the 1972 Tourist Trophy, but was eliminated because of gearbox failure. For 1973, an entirely new machine with a monocoque frame/ tank was developed, which gave Williams a well-deserved TT win. Flushed with its racing success, Norton launched an exclusive run of 750 Production Racers, replicas of the works john Player Norton team bikes, to be sold to private entrants. The next move was far more commercial; late in 1974, Norton unveiled a production John Player replica intended to add sparkle to an aging model line-up. was this unit that was fitted in the ]PN replica. There were further compromises: the replica had neither the light-alloy rims nor the rear disc brake of the racing machine. But did it really matter? The JPN replica was reasonably priced and a delight to ride. Seen here at the famed Montlhery banked circuit south of Paris, the Norton John Player Replica is today a valued collector's piece.